The work of artist, educator, and naturalist Gertrude Kundman "Tula" Erskine (1907-2000) spans much of the twentieth century. Her life exemplifies several transitions in the way we can depict and appreciate the world around us. Tula was native of Milwaukee who traveled the world but lived her whole life in this community, as artist, educator, and naturalist. This catalog accompanying a 2017 exhibition of her work at the Urban Ecology Center in Milwaukee includes new essays by Dr. Chris Young, "Naturalist art inspires community science", and Elfrieda Abbe, "Isn't that a handsome mushroom!" (The Life and Legacy of Gertrude Kundman Erskine). 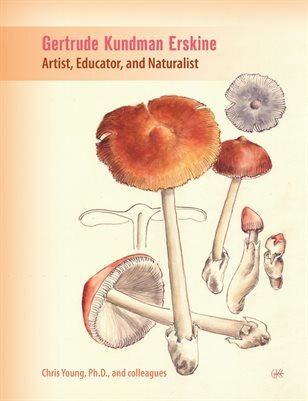 The catalog also includes small reproductions of all fifty of Tula's mushroom illustrations meant for a never-published book.